Read the White Paper on how scanners can save your business a small fortune! Scan to a network folder, Scan to a network fax, Scan directly to e-mail, Scan to a network printer, Scan to FTP server, Scan to Microsoft Sharepoint. Scanning speed is consistent at 25 pages per minute (ppm) even when scanning full A4 color, double-sided, at 300dpi. 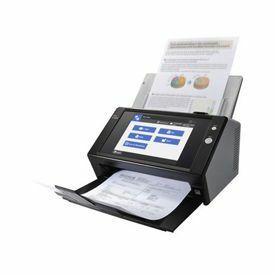 N7100 is equipped with accurate and stable feeding mechanisms that support scanning from thin paper to thick paper, and plastic card. The N7100 achieves high security on the premise that it is shared by multiple users. Not only verification before scanning, but also encryption while processing and data deletion after scanning are performed automatically. Users can use the network scanner with peace of mind. The N7100 touch panel job menu and scan settings can be customised to suit the work of a specific user or user group registered to the scanner. The user’s application can be integrated to the scanner as add-in software using the exclusive SDK (for Windows). N7100 comes with an open USB port to connect a keyboard or other USB devices(2) (except USB memory). N7100 can be customized to be a terminal exclusively for your operation.